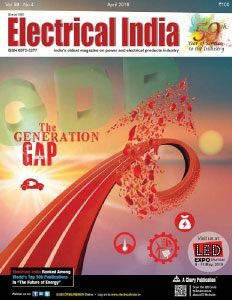 Outdoor lighting is a prerequisite for improved visibility and safety of drivers, riders and pedestrians, analyses Shrikant Mahankar, Senior Analyst at MarketsandMarkets. Outdoor lighting plays a vital role in ensuring the safety and security of public places, streets, pathways, and walkways. To ensure the safety and security of these places, it is necessary to use the right lamps and appropriate fixtures with proper luminance. It also becomes necessary for lighting systems to follow the lighting standards and guidelines to ensure the safety of people, property, and public spaces. Outdoor lighting system is a prominent requirement for applications such as highways, roadways, airport perimeters, architectures, and other public places. LEDs are increasingly implemented in the outdoor lighting application to control the growing energy consumption of lights. Most countries such as the US, the UK, and Germany are replacing their conventional streetlight lamps with advanced LED lights and luminaires. Of the various light sources available for outdoor lighting, there is a very high demand for LEDs because LED lighting consumes 85 per cent less energy compared to traditional light bulbs. Governments across countries such as the US, the UK, France, and Germany are promoting the use of solidstate lighting across applications. The US government has been promoting the use of LED streetlights over conventional streetlights owing to their advantages such as reduced power consumption, long-lasting fixtures, and less maintenance cost and CO2 emission. In 2013, more than 600 cities in the US planned to install LED streetlights. LEDs offer multiple benefits over traditional conventional lamps for outdoor lighting. 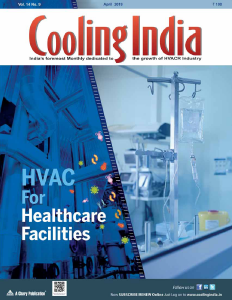 Some of its major benefits include high energy-efficiency, high efficacy, long working life, and robust weatherproof designs. LED lamps are expected to hold the largest market share for outdoor lighting in the near future because of its benefits over conventional lamps. LEDs have witnessed exponential growth in the outdoor lighting market for the last few years. Thus, it is necessary to understand their evolution and adoption.  Longer lifespan: The longer life span of LED lamps leads to lower carbon emissions and lower maintenance cost. LEDs are said to last six times longer than other light sources. LEDs have operational efficiency of approximately 100 hours, which is much higher than that of other light sources such as halogens as well as incandescent and fluorescent lamps. The long lifespan of LEDs results in the use of fewer lights. Hence, fewer resources are needed for manufacturing processes, packaging materials, and transportation.  Ecologically friendly: LED lights are free from toxic chemicals, while other light sources such as fluorescents and halogens that are used in street lights contain toxic chemicals such as mercury, which can harm the environment. Due to the lesser carbon emission and use of environmentally friendly materials in LEDs, governments worldwide are also emphasising on their implementation in the outdoor lighting application.  Energy- and cost-efficient: LEDs enhance the light levels and quality of illumination, reduce light energy consumption significantly, and require less maintenance. Moreover, rebates of up to 60 per cent of the project can be achieved with the implementation of LEDs. In outdoor lighting, LEDs offer energy savings of 50 per cent to 90 per cent compared to HIDs, the most common alternative. LED is also eligible for tax savings (according to the Energy Policy Act). The growing advancements in LED lamps are expected to increase the energy efficiency further. Thus, LEDs would hold the largest market share in terms of applications in outdoor lighting. 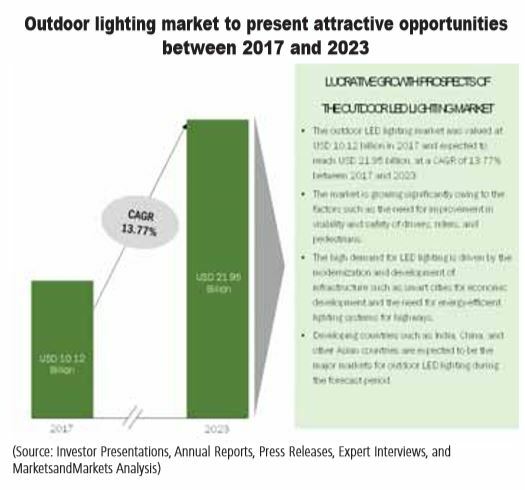 According to MarketsandMarkets, the global outdoor LED lighting market is expected to grow from $ 10.12 billion in 2017 to $ 21.95 billion by 2023, at a CAGR of 13.77 per cent during the forecast period (2017–2023). 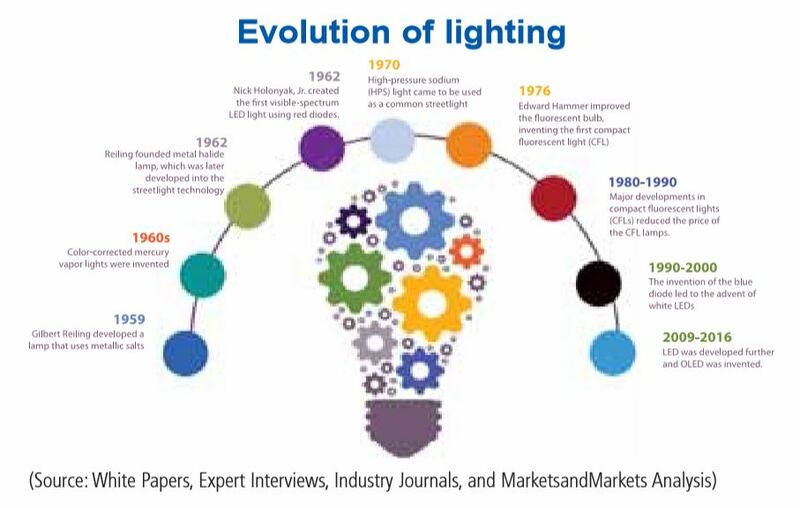 This growth is attributed to drivers such as the need for energy-efficient lighting systems, declining prices of LED lamps, and the high demand for environmentally friendly lighting solutions as a result of modernisation and the penetration of LEDs as a light source in general lighting applications. The architectural and outdoor lighting segment of the LED lighting market is expected to hold an around 20 per cent share of the total LED market.  Controllability of LEDs: LEDs offer control solutions for large areas, ranging from streetlights to architectural applications. They not only enable users to operate the lighting of the system easily but also offer an energy- and cost-effective solution. The combination of individual optics with LEDs is expected to increase the efficiency of the light and offer more precise illumination. For instance, Eaton’s Galleon LED luminaire offers 16 different optics, all optimised to provide a range of distributions. Even distribution of light is crucial for the outdoor lighting application to ensure the safety and security of an individual. 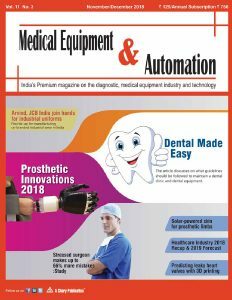 Due to the higher adoption of control systems in LEDs, the market for the software segment of outdoor lighting is expected to grow at a CAGR of 14.58 per cent from 2016 to 2023.  Replacement of light sources: Owing to the growing awareness regarding energy-efficient lamps, users across the globe are replacing their traditional lamps with new LED lamps. This is expected to lead to sustainable growth in the LED market in the coming years. The halogen and fluorescents lamps used in street lights, architectures, and public spaces are either retrofitted or replaced to leverage the benefits of LED lamps.  Internet of Things (IoT)-equipped lighting systems offering financial advantage: A survey conducted by Continental Automated Buildings Association (CABA), dated March 2017, indicated that the lighting systems equipped with IoT can offer several financial advantages. The data tracked and generated through IoT can help understand how buildings are performing and can suggest ways to identify opportunities to optimise energy consumption. In addition to the financial advantage. IoT equipped lighting systems are also expected to offer benefits such as space utilisation, improved efficiency and productivity, and enhanced comfort.  LED lighting for the outdoor entertainment sector is expected to witness significant opportunities in the second half of the forecast period. This includes concerts, award functions, sport tournaments, and other performance arts, which, in addition to basic lighting, include modern stage lighting as well as special effects such as lasers and fog machines.  Europe: Incandescent lamps have been phased out and halogen lamps have been banned. This is driving the adoption of LED in the region.  North America: Incentives from the government are encouraging users to shift from traditional to conventional lighting.  Asia Pacific: Developing economies, such as India and China, are adopting LEDs at the highest rate for outdoor applications. The smart cities initiative by the Government of India further drives the demand for LEDs as an energyefficient lamp source.  Middle East and Africa: Greater adoption of LEDs expected during the second half of the forecast period owing to the growing awareness and reducing prices.  Latin America: Outdoor sport events, such as Olympics, are expected to drive the market during the forecast period.  Revenue forecast, by end-use application: Public places (including airport perimeters, parking structures, stadiums and area floodlighting, and entertainment) are anticipated to witness the highest growth rate, while the highway and roadway segment is expected to hold the largest market share by 2023.  Regional revenue forecast: 2014–2023 (North America, Europe, Asia Pacific, Middle East and Africa, and Latin America)—APAC is expected to be the largest and fastest-growing market.  The demand for smart controls for street lighting system is expected to grow in the future. Street lights are expected to be able to perform multiple functions in the future including notifying of or registering a change in traffic volume and feeding that data into an intelligent transport system (ITS).  The need for improvement in the visibility and safety of drivers, riders, and pedestrians would ensure the installation of light sources providing distributed illumination. include Philips Lighting Holding B.V. (Netherlands), General Electric Company (US), OSRAM Licht AG (Germany), and Cree, Inc. (US). LEDs are expected to rapidly replace conventional lamps. Moreover, the installation of solar panels in lighting modules and connected lighting would further help in the conservation of energy in outdoor lighting systems. LED-based solid-state lighting (SSL) systems are relatively easier to control and are expected to witness greater evolution in the future. The central control of outdoor lighting with the involvement of a variety of datalink- and physical layer protocols may be used to provide a complete solution for smart streetlights. The increased competition among players manufacturing outdoor lighting is resulting in the development of new advanced technologies to offer comfort and ease to the users. A major development in this path is the focus on making things increasingly connected. 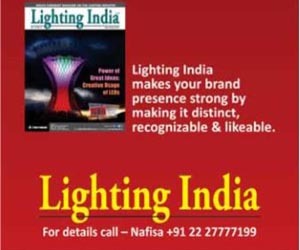 The drive for connected lighting is the future trend among the outdoor lighting manufacturing companies. The latest development in LED is organic LED lighting (OLED). This next generation of solidstate lighting technology—OLED—is creating an interest among the manufacturers and consumers, which is expected to drive the implementation of this technology in outdoor lighting in the future.